HomeThe Creation of HMRC from Inland Revenue and Customs & Excise – Double Trouble? The Creation of HMRC from Inland Revenue and Customs & Excise – Double Trouble? Given Labour’s announcement today that it will carry out a review of HMRC if elected in May, I thought it might be useful to publish this little paper I wrote about the creation of HMRC for an IPPR seminar 10 years ago. It will be useful background for all those out there trying to understand how HMRC got to where it is today. The final section about ‘challenges’ facing the merged organisation has turned out to be reasonably prophetic. The merger of HM Customs and Excise and Inland Revenue to create the new HM Revenue and Customs is the biggest reform of UK tax collection in hundreds of years. HMCE and IR were two of the oldest surviving departments of state with an unusual status within the British system as ‘non-ministerial departments’. Together they represent around one fifth of all UK civil servants. So on many counts this merger represents a significant event. This paper will examine this merger in the wider perspective of public management reform over the past two decades or more. It will show that the merger runs contra the supposed dominant mode of public management reform usually evoked with the phrase “new public management” (NPM). Bureaucracy is used in this paper not in its popular and pejorative sense, but simply as short-hand for a particular way of organising which includes six key principles: fixed jurisdictional areas; strict super- and sub-ordination; written rules; written files; full-time officials (selected on merit); and training (Weber). In its democratic version this included also strict lines of accountability, a policy-administration split and usually some form of external audit and inspection. Traditionally, the ‘ideal type’ bureau was a large, centralised, multi-functional ministry or department with a strong hierarchy and rule bound culture . In reality of course, bureaux have been rather more diverse than this ‘ideal type’ . Alongside this ‘machine bureaucracy’ model (as Mintzberg termed it ) there have also been variants: such as ‘professional bureaucracy’ (where the core activities are driven by professional cadre); the ‘divisional form’ (similar to M-form companies ; etc. etc. A key component of NPM has been the idea of “unbundling government” – breaking up large scale, supposedly monolithic, public organisations into smaller and more autonomous units . This has gone under various labels – decentralisation, disaggregation, devolution, deconcentration, etc. It has been applied to virtually every part of the public sector in the UK, including education, health and the civil service. It has been a international, though not necessarily global, trend . In more theoretical language it has been described as part of a move to post-Fordism , post-bureaucracy  and breaking through or banishing bureaucracy [9, 10]. For some writers this is part of ‘paradigm shift’ from the mass-production, large-scale, hierarchical and bureaucratic organisation which dominated most of the 20th century. So ubiquitous was the large-scale bureau and its legions of managers in both democratic and non-democratic states and public and private sectors that the American ex-Trotskyist James Burnham was able to write a highly influential book during the second world war which foresaw the managerial take-over of the world . By around the late 1970s, it has been argued, the underlying production model which this represented was being undermined by socio-technical changes and ‘small batch’ production was becoming a more efficient and – more importantly – flexible model in a rapidly changing world [12, 13]. The most emblematic book which is some ways marks the start of this period – and an almost direct counter-point to the Burnham thesis – was entitled ‘small is beautiful’ . Although it was based on a rather different analysis it caught the mood of the times. contractualisation of the relationship between these units and their ‘parent’ organisation, with a focus on ‘performance’ (usually defined in terms of outputs); . To many – especially internationally – the Next Steps programme symbolised not just NPM, but one of the latest, best, things in public management and it was widely emulated in countries as diverse as the USA, Jamaica and Tanzania – indeed it can fairly be described as an international policy fashion . The phenomenon was so prominent that by 2002 OECD was prompted to publish a major report on ‘Distributed Public Governance – Agencies, Authorities and Other Government Bodies’ . Specifically, and interestingly for this paper, Next Steps type reforms have been widely applied to revenue collection agencies in Latin America and Africa . The reality of the ‘Next Steps’ programme in the UK – and indeed other such programmes – was rather different than the ‘official story’ (often accepted uncritically by academics who should know better). Additionally, it was often distorted in transit or in a between the UK and new host countries . “the emerging picture is a complex one. On the one hand, there seems to be a widespread belief, derived from a variety of theoretical traditions, that agencification can unleash performance improvements. On the other hand, systematic evidence for some of the hypothetical benefits is very patchy. Furthermore, the diversity of actual practice in different countries has been so great that there must sometimes be considerable doubt as to whether the basic requirements for successful performance management are being met.” . agency performance had improved, although again the evidence and what it showed was patchy and sometimes contradictory. An official review of agencies was more positive about the programmes achievements but also identified a series of problematic issues . Customs & Excise (C&E) and Inland Revenue (IR) appear as classical public bureaucracies according to a semi-official series published in the early 1960s [25, 26]. Little had changed by the time of the Next Steps initiative. So where did they fit into the ‘Next Steps’ programme? It is necessary to understand the (almost) unique constitutional and legal position of C&E and IR. Unlike most of the rest of central government in the UK C&E and IR existed through legislation – most UK ministries exist only through the powers of ‘crown prerogative’ exercised by the Prime Minister of the day . This historical anomaly seems to have arisen from two sources – first, the struggle between Crown and Parliament over control of public finances and second, the need to keep individual tax affairs secret from Ministers. Consequently the C&E and IR were not just legislatively based (and therefore more under the theoretical control of Parliament) but also were ‘non-ministerial’ departments with an appointed Chairman rather than a Minister at their head. (In this respect, they are somewhat similar to US federal agencies ). 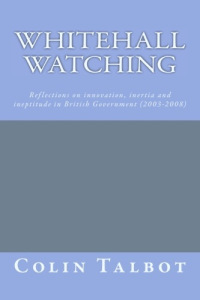 Despite this (almost) unique status in the UK’s system, C&E and IR were in all other respects the same as other Ministries – especially with regard to controls over personnel, finance and other managerial issues. They were already in a sense ‘disaggregated’, if the Treasury is regarded as their ‘parent’ ministry (in some countries tax agencies are part of the finance ministry). They already had considerable de facto and de jure devolution of power over finance and personnel issues, as did most government departments by 1988 . They had no-one to contract with – they did not have a Minister. Nevertheless, C&E and IR were soon being described as ‘working fully along Next Steps lines’ in a variety of government publications. ‘Framework Documents’ negotiated with the Chancellor (although the status of these given C&E and IR’s statutory basis is unclear). Key Performance Indicators (KPIs), again apparently negotiated with the Chancellor. Very little further information – other than their existence – has ever been made public about these ‘whole of organisation’ arrangements for C&E and IR. A little more (but not much) is known about what happened inside each organisation. Alongside applying some Next Steps principles to C&E and IR as entities they were also, again partially, applied inside each organisation to the relationship between ‘line’ organisations and the ‘centre’. IR created what were called “operational executive offices” of which by 1993 there were 25 . These were not disaggregated, in the sense that they were simply organisational units within IR. They did have ‘framework documents’ and annual performance targets which formed the basis of a quasi-contractual relationship with the departmental centre. C&E had similar internal Next Steps type arrangements with 31 “executive units” employing some 95% of IR staff in 1993 . Inland Revenue was faced, in the early stages of the New Labour government, with major changes to their operations. Firstly, through the innovation of ‘tax credits’ replacing various forms of benefits being paid to working people, IR effectively became a tax and benefits agency. Both of these changes – but especially tax credits – meant massive organisational change. The conclusion of the then IR Board was that they had to “recentralise in order to manage the change process successfully”  So the executive offices experiment was quietly dropped and IR reverted to a simple managerial hierarchy. Although C&E did not have such dramatic changes to its functions, a similar pattern of recentralisation seems to have occurred and the “executive units” were first reduced in number (through mergers) and then finally effectively returned to the same ‘normal’ managerial arrangements as for other units within C&E. The fact that both C&E and IR effectively retreated from the internalised Next Steps arrangements suggests that the explanation of the need to centralise to manage large-scale change (IR) is not the only variable at work. “It [could be argued] the process of change has thus less changed the identity and culture of the organisation than reasserted them in a more dynamic and strengthened form in pursuit of its core functions and objectives….” . Another factor may have been the inception of very large scale IT systems, associated with moves to ‘e-government’. Such large-scale systems as both IR and C&E were introducing (with in both cases long-term contracting arrangements with private sector partners) require a great deal of standardisation of processes and activities – which requires central control. This significantly reduces the scope for managerial autonomy at the operational unit level. It is unclear whether some, all or none of these factors were behind the retreat from ‘Next Steps’. This is clearly a set of events which requires further research which is beyond the scope of this paper. One further issue needs to be mentioned before proceeding to discuss the creation of HMRC – that of the so-called “policy and operations” split. The idea of splitting policy and implementation (or operations) is of course a venerable one in classical public administration. Woodrow Wilson (alter US President Wilson) famously coined the doctrine of separating policy-making – (the domain of elected representatives) and implementation (the domain of bureaucrats) at the start of the 20th century. This notion has frequently been challenged, theoretically, normatively and in practice but has nevertheless held on tenaciously as a principle in many actual public administrations, not least the UKs. In this context the new HMRC has been established on an interesting basis. The new non-Ministerial department, unlike its predecessors, is assigned only a ‘policy maintenance and implementation’ role . Policy-making has been explicitly and exclusively transferred to HM Treasury. This ends centuries of policy-making by IR and C&E, where a large amount drafting legislation, of ‘interpretive’ policy-making implementing primary legislation and areas of non-legislative policy have always taken place. This represents a significant shift of power to the Treasury – one amongst many since 1997 [39, 40]. The actual decision to create HMRC was however clearly heavily influenced by the ‘Gershon’ agenda for efficiency savings in UK government as well as the experience of the Jobcentres plus merger . Gershon is heavily predicated on achieving economies of scale in purchasing and the supply of various back office functions. Whilst this is mostly envisaged as being achieved through collaborative arrangements there is a natural tendency for the idea of mergers of similar functions to arise in such circumstances. The functions included in the new HMRC are multiple and therefore the type of ‘economies of scale’ to be achieved are very much of the Gershon back-office and purchasing type. Despite the fact that in the crucial area of IT systems there are major obstacles (including existing systems and long-term contracting arrangements) [38, 41] these are still expected to lead to the major savings. Some 10,500 posts (net) are expected to be cut through greater use of “e-services, processes and e-filing” . Back to ‘Big is Beautiful’? The UK government continues to claim that its civil service has largely been reorganised ‘along Next Steps lines’ and the impression that is created is of a highly decentralised, disaggregated and almost networked civil service. In reality, the former C&E and IR had clearly abandoned Next Steps in favour of recentralisation. If these organisations are excluded from the agency figures, only about 55% of UK home civil servants were still working in what were officially designated as agencies – i.e. 176,060 out of 512,410 fte’s . The picture is even more dramatic if the un-contested agencies are examined – of the 176,060 working in these over two-thirds work in the largest two agencies – Prisons (43,210) and Jobcentres plus (78,860). Hardly a picture of ‘small is beautiful’. The merger of C&E and IR to create a new body with over 100,000 staff (at least initially) further strains the credibility of any claims that the UK civil service has been ‘broken up’ under Next Steps. Indeed, with the three biggest bodies now employing almost half the civil service this is less an ‘unbundled’ organisation and more a differently organised hierarchical one. In many respects they appear to be classical bureaucracies. Some of their features appear ‘post-bureaucratic’ but are not. For example, the idea that decentralising authority for determining personnel matters from the centre to the line is somehow ‘post-bureaucratic’ is nonsense. It is, rather, what some writers have called a ‘deceptive variation’ on the bureaucratic theme which in some ways actually goes back to a purer form of bureaucracy (in this case proper delegation) as properly understood . Just because bureaucracy is about rules does not mean they have to be made at the centre. In this case, these disaggregated organisations (in some cases very large ones) still have rules, simply ones which are determined locally within the organisation and have usually been greatly simplified. A real ‘post-bureaucratic’ organisation would not have any rules. This is rather what these authors call a ‘cleaned bureaucracy’ . “Bureaucratic institutions still work in some circumstances. If the environment is stable, the task is relatively simple, every customer wants the same service, and the quality of performance is not critical, a traditional public bureaucracy can do the job. Social security still works. Local government agencies that provide libraries and parks and recreational facilities still work, to a degree.”  (pp 15-16 – emphasis added). What Osborne and Gaebler do not offer, apart from this intriguing aside, is any criteria for deciding when bureaucracy is the preferred option (indeed they never even mention it as possible option again anywhere in the book). Others have sought a more explicit and developed argument that bureaucracy is still a viable model [44, 45]. In essence, the argument that can be made is that where equity, probity and due process are paramount values – as in tax collection and benefits payments – bureaucracy may be the worst alternative, except for all the others (to paraphrase Churchill). The questions we left with is will the merger of C&E and IR work, and by what criteria and on what evidence is it to be judged? What are the main pitfalls? It is entirely possible to assess how far these objectives have been met. Whether or not such an assessment is ever made by government is doubtful given in general public organisational reform in the UK is under-evaluated. Firstly, the experience of trying to achieve change under Next Steps within the old IR and C&E suggest two things: firstly, that change is difficult in such well-established organisations with such huge histories behind them – what academics have called ‘path dependency’; secondly, that there may well be ‘task specific’ determinates which circumscribe the type of organisational design that will ‘work’ for specific types of functions – such as tax collection. Combined, this produces what has been called ‘task specific path dependency’  – that is what is possible in changing organisations is determined by both its history and its function. Secondly, the change is highly dependent on large-scale IT systems to support e-government initiatives which can support the ten thousand plus (10%) reduction in the workforce. “My experience of managing the two departments is they have a range of cultures in them and there is considerable overlap. The reason they have cultural differences is because they have got different tasks. I think one of the tricks for us is to be clear about why different cultures are appropriate in different situations.” . HMRC is therefore apparently to operate as essentially an M-form, divisionalised, organisation with different cultural norms operating in different task areas. This is perfectly feasible but as the literature on strategic management of similar multi-divisional companies in the private suggests, is indeed “tricky” [4, 47]. Fourthly, the shift of policy-making to HM Treasury enters new territory. It could work well, but it could also generate all sorts of potential problems: poorly designed policies ill-informed by experience of the actuality of revenue collection, benefits credits and law enforcement; policy instability fuelled by politically determined short-termism; increased political salience of policy decisions – when such decisions are made by Ministers rather than officials they automatically become more high-profile; etc. Fifthly, the new accountability arrangements are also untried. The Executive Chairman reports to three different Treasury Ministers’ on different aspects of his work . Even the change in name is significant for accountability – in C&E and IR the role was of Chairman – no ‘Executive’. The implied change in the status of the role – from a fully independent Chairman to a more directed ‘Executive Chairman’ implies a significant change in relationships. Coupled with the shift in policy responsibilities this raises important questions about accountability. Under the old arrangements the Chairmen of IR and C&E were much more accountable to Parliament and less to Ministers, that relationship has clearly shifted but the implications remain unclear. The role of the Remit agreed annually with the Chancellor and the Framework Document also remains unclear. Given the problems about accountability these type of arrangements have generated in the past (e.g. the Derek Lewis-Prison Service affair [48, 49]) it seems that this is potentially explosive. None of these concerns individually or collectively mean that HMRC will fail, but it does mean it faces huge challenges. And these are not just challenges for HMRC. Ministers, Parliament, the NAO, the courts, the accountancy professions, and taxpayers all face challenges arising from the merger. This is a big institutional change and the outcome is, to say the least, uncertain. Hughes, O.E., Public Management and Administration (3/e). 2003, London: Palgrave. Wilson, J.Q., Bureaucracy – What Government Agencies Do and Why They Do It. 1989: Basic Books. Mintzberg, H., Structure in Fives. 1983: Prentice-Hall Int’l, NY. Chandler, A.D., Strategy and Structure: Chapters in the History of the American Industrial Enterprise. 1991: MIT Press. Pollitt, C. and C. Talbot, eds. Unbundled Government: A Critical Analysis of the Global Trend to Agencies, Quangos and Contractualisation. 2004, Routledge: London. Pollitt, C. and G. Bouckaert, Public Management Reform – A Comparative Analysis (2/e). 2004, Oxford: Oxford University Press. Amin, A., ed. Post-Fordism: A Reader. 1994, Blackwell: Oxford. Heckscher, C. and A. Donnellon, eds. The Post-Bureaucratic Organization. 1994, Sage. Osborne, R. and Plastrik, Banishing Bureaucracy. 1997, Reading, Mass. : Addiuson-Wesley. Barzelay, M., Breaking Through Bureaucracy – A New Vision for Managing in Government. 1992, Berkley: University of California Press. Burnham, J., The Managerial Revolution. 1942: Putnam, London. Burns, D., R. Hambleton, and P. Hoggett, The Politics of Decentralisation – Revitalising Local Democracy. 1994, London: Macmillan. Hoggett, P., A farewell to mass production? Decentralisation as an emergent private and public sector paradigm. 1987. Schumacher, E.F., Small Is Beautiful – Economics as if People Matter. 1973: Harper & Row. Hood, C., A Public Management for all Seasons? Public Administration, 1991. 69(1). Common, R., N. Flynn, and E. Mellon, Managing Public Services – competition and decentralisation. 1992: Butterworth-Heinemann. Pollitt, C., J. Birchall, and K. Putman, Decentralising Public Service Management. 1998, London: Macmillan. Talbot, C., The Agency Idea: sometimes old, sometimes new, sometimes borrowed, sometimes untrue, in Unbundled Government, C. Pollitt and C. Talbot, Editors. 2004, Routledge: London. Pollitt, C., et al., Agency Fever? Analysis of an International Policy Fashion. Journal of Comparative Policy Analysis. Vol. 3. 2001: Springer Science+Business Media B.V., Formerly Kluwer Academic Publishers B.V. 271 – 290. OECD, Distributed Public Governance – Agencies, Authorities and Other Government Bodies. 2002, Paris: OECD. Taliercio, R.R., The design, performance and sustainability of semi-autonomous revenue authorities in Africa and Latin America, in Unbundled Government, C. Pollitt and C. Talbot, Editors. 2004, Routledge: London. Talbot, C., Executive Agencies: Have They Improved Management in Government? Public Money & Management, 2004. 24(1). Jenkins, K., K. Caines, and A. Jackson, Improving Management in Government: The Next Steps. 1988: HMSO, London. Alexander, P. and Agency Policy Review Team, Better Government Services – Executive Agencies in the 21st Century (The Agency Policy Review – report and recommendations). 2002, Cabinet Office: London. Johnston, A., The Inland Revenue. The New Whitehall Series No. 13. 1965, London: George Allen & Unwin Ltd.
Crombie, J., Her Majesty’s Customs and Excise. The New Whitehall Series No. 10. 1962, London: George Allen & Unwin Ltd.
Harden, I., The Contracting State. 1992: Open University Press. Carpenter, D., The Forging of Bureaucratic Autonomy – Reputations, Networks and Policy Innovation in Executive Agencies 1862-1928. 2001, Princeton: Princeton University Press. Talbot, C., UK Civil Service Personnel Reforms: Devolution, Decentralisation and Delusion. Public Policy and Administration, 1997. 12(4). Chancellor of the Exchequer, Departmental Report of the Chancellor of the Exchequer’s Departments Cm 2517. 1994, HM Treasury: London. Cabinet Office, Civil Service Statistics. 2004, Cabinet Office: London. Doig, A. and M. Graham, Dancing to whose tune? Change and investigations in HM Customs and Excise. Public Administration, 1998. 76(3). Colville, I., K. Dalton, and C. Tomkins, Developing and understanding cultural change in HM Customs and Excise. Public Administration, 1993. 71(4). Colville, I. and C. Packman, Auditing Culutrual Change. Pubic Money & Management, 1996. Greer, P., Transforming Central Government – The Next Steps Initiative. 1994, London: Open University Press. Kemp, P., Interview with Author. 1996. Kemp, P., Beyond Next Steps: A Civil Service for the 21st Century. 1993: Social Market Foundation. O’Donnell, G., Financing Britain’s Future – Review of the Revenue Departments – Cm 6163. 2004, HM Treasury: London. Deakin, N. and R. Parry, The Treasury and Social Policy. 2000, London: Macmillan. Talbot, C., A Treasury Equation. White Paper, 2002e. 1(1). Treasury Committee, The Merger of Customs & Excise and the Inland Revenue HC 556. 2004, House of Commons: London. Gershon, P., Releasing Resources for the Frontline: Independent Review of Public Sector Efficiency (Gershon Review). 2004, HM Treasury: London. Osborne, D. and T. Gaebler, Reinventing Government – How the Entrepreneurial Spirit is Transforming the Public Sector. 1992: Addison-Wesley. Du Gay, P., In Praise of Bureaucracy: Weber, Organisation and Ethics. 2000, London: Sage. Goodsell, C., The Case for Bureaucracy: A Public Administration Polemic. 1994: Chatman House. Pollitt, C., et al., Agencies – How Government’s Do Things Through Semi-Autonomous Organisations. 2005: Palgrave. Goold, M. and J. Quinn, Strategic Control. 1990, London: Hutchinson Business Books. Talbot, C., The Prison Service: A Framework of Irresponsibility? Public Finance Foundation Review, 1995(8). Talbot, C., The Learmont Report – Who is Responsible for Prisons? Prison Service Journal, 1996(February). Sir Nick Montagu, former Chairman of IR, in conversation with the author. ← Breaking the Democratic Ties That Bind Us?